If you like high end kitchen tools, but don’t happen to live in a big city like Toronto, then you probably do most of your shopping online. 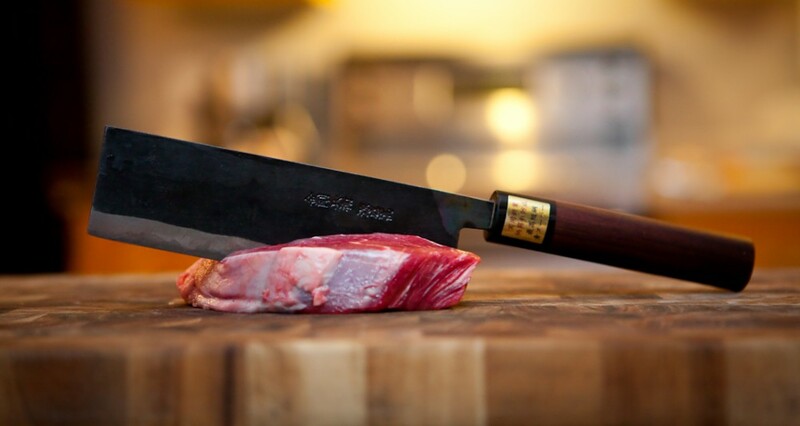 Kitchen supplies, particularly high end knives, are often sold through smaller, more specialized niche companies, which can make making a purchase seem like a leap of faith. I have bought from many online retailers with varying degrees of success. I am writing today about one of the best, Williams Food Equipment. 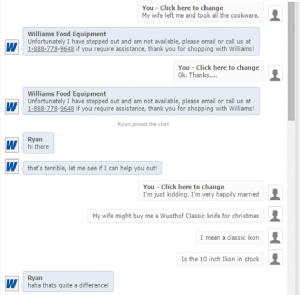 Williams Food Equipment appears to be one of the largest suppliers of “food equipment” in the country. They have a large selection of just about every type of kitchen product. I have bought several Wusthof knives and Le Cruset pots and pans from them and have no major complaints about any of my purchases. They generally have products in stock, which is big factor when buying online. Some retailers have slick looking websites but are small and unable to maintain much inventory, so you sometimes have to wait weeks, if not months, to receive your order. My first order from Williams did take almost two weeks to ship, but that was an exception. My other orders shipped right away. One great thing about them is that they are very responsive. 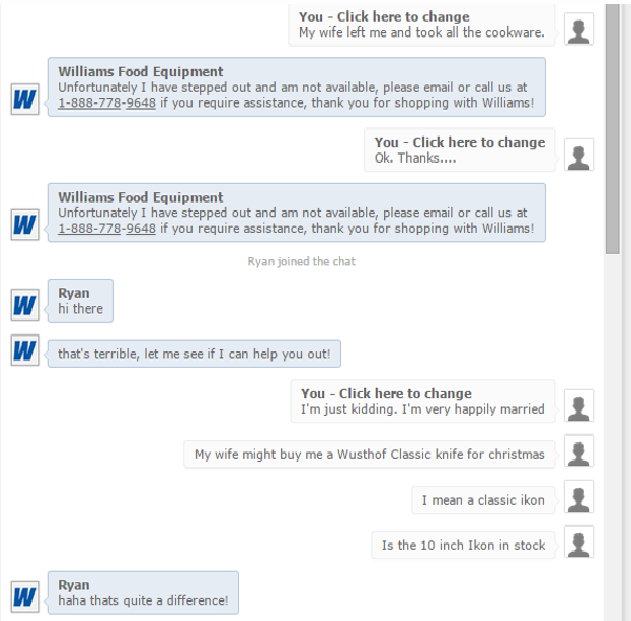 When you go the website a chat window will open, and they will actually respond to you quite quickly. When my first order was delayed, someone would always respond to my inquiry. They were honest about the fact that my knives were not in stock when I made my purchase and that they were waiting on a shipment from Germany. One thing that some people find slightly annoying about the site is that while you are browsing a chat window will pop up. Most people hate pop ups but the saving grace for this website is that they seem to employ some bright, good natured people to man the chat rooms. One night I decided to have a little fun with them just to see how they would react, and the person on the other end was both professional and good-natured. I have included an excerpt of the exchange below. One thing that rubs me the wrong way a little bit is that they are one of these retailers that always have a major sale. I am on their mailing list, so every week I get notified of a major sale. Valentine’s sale, St. Paddy’s day sale, Easter sale, lunar eclipse sale, etc. You need to browse the site regularly and compare to other sites to be clear on what exactly is a sale is and what isn’t. Generally you will find that even if you are not getting the once in a lifetime deal you thought, you can be usually be confident that you aren’t paying any more than you would at any other site. This entry was posted in Reviews and tagged kitchen knives, Kitchen Supplies, Online Kitchen Tool Retailers, Williams Food Equipment by peasantgourmand. Bookmark the permalink.